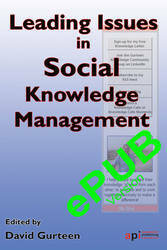 A collection of important Social Knowledge Management papers Published bu Academic Publishing International. Perhaps one of the most surprising if not actually unsettling things about the Internet and the Web is that there is always something new on the horizon and that it is very difficult to see where this new technology will take us. When ICT was just about big computers and organisational systems it was pretty obvious where the technology was moving us. We all knew about Moore’s Law and that we were going to have greater capacity, smaller and faster devices every year. And during the 1990s and the first decade of the third millennium we all became used to what the Internet and the Web had to offer. But Social Software in the form of Web 2.0 is different. It has put technology in the hands of people who we would never have given it a second thought a few years ago. 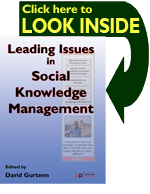 Leading Issues in Social Knowledge Management contains leading edge research which addresses some of the main issues for those of us who want to use Social Software in a Knowledge Management context or who want to study it or research it. There are 10 research papers as well as an introduction from David Gurteen who is a leading thinker in this field.